John Williford is a natural at relating and connecting to people. With a highly personable nature, John enjoys meeting and serving all types of clients, partners and colleagues. Early in his education and career, John thought he would head to law school and instead became attracted to public finance. 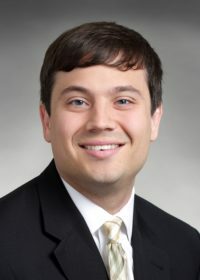 He began his career in 2010 at Public Financial Management (“PFM”), in the Quantitative Strategies Group, where he completed and later taught a ten-week technically challenging training course to new employees. John then transitioned to PFM’s financial advisory practice in Austin, Texas, where he was part of the quantitative strategies group, training new hires. During his tenure, John was consistently ranked in the top of his peer group every year for three years. John went on to join the team at FTN Financial Capital Markets (“FTN”)in 2013. At FTN, John served as the lead quantitative and support banker, covering the southeast, Texas, California, New York, and Missouri. When the company decided to create a public finance department John was the fourth person hired into the group. Most notably in 2014, John was named Public Finance Employee of the Year. was lead supporting banker for the financing of Legacy at Willow Bend, which was submitted for consideration in the Bond Buyer Deal of the Year. John earned a B.A. in history and an M.A. in management from Wake Forest University. John holds his Series 7, 63, 52, 50, and 79. Originally from Charlotte, North Carolina, John currently lives in Dallas, Texas with his wife and young daughter, with whom he relishes spending quality time. John and his wife regularly enjoy watching Netflix – especially history documentaries.